This guide will demonstrate how to configure SharePoint Foundation 2010 in the Cobweb Control Panel, presuming that you have already purchased the service and the appropriate resources. Login to the Cobweb Control Panel (https://controlpanel.cobweb.com). 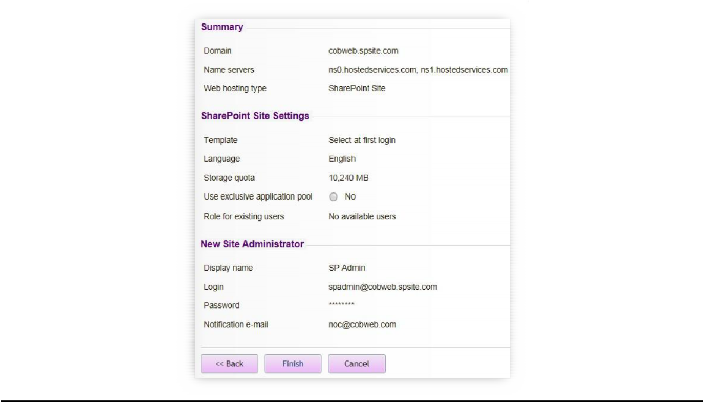 You now need to choose an address for your SharePoint site; this must end in '.spsite.com' (E.G. 'cobweb.spsite.com'). You should enter this into the Domain field and then change the Web Hosting dropdown to SharePoint Site, then click Next. You now need to specify details for the Site Collection Administrator. You should choose these details carefully as they cannot be changed at a later date. Ensure you change the login dropdown to the '.spsite.com' address you added earlier. Select the SharePoint Web application as Shared and go to Next. Set the desired template for your SharePoint site and set a storage quota. The storage quota must be entered for your SharePoint site to work. Review the details you have entered and go to Finish. Your SharePoint site is now configured.